Atari is the source of a recent legal dispute stalling continued work on the Baldur's Gate: Enchanced Edition and its sequel. 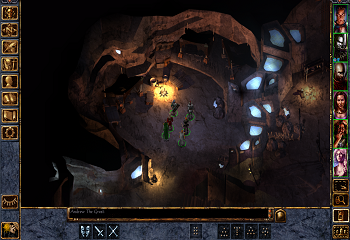 The Baldur's Gate: Enhanced Edition offered gamers and longtime fans of the game a spruced up version of one the role-playing genre's most beloved classics. You can imagine the surprise of some, in turn, when it was revealed Beamdog and Overhaul Games, the teams behind the Enhanced Edition, were being forced to pull the game from Beamdog's website and Apple's App Store on account of some unexpected legal issues. In the wake of this, some noted that the Steam version of the game, managed by Atari, had been left up and available for consumers to purchase and play. Now, Beamdog CEO Trent Oster has revealed that Atari is in, in fact, behind the games impromptu removal. "At the request of Atari legal we removed the game from sale on Beamdog and the App stores," said Oster. "Atari is still selling the game through their channels. We're trying to remedy the situation and I'm hopeful we can come to an arrangement." Oster was unable to offer any further details as to why Atari had requested the game to be pulled. In the mean time, work on a promised patch and Android edition of Baldur's Gate: Enhanced Edition have been stalled. Likewise, work toward the launch of Baldur's Gate II: Enhanced Edition has been put on hold until a resolution to the current issues can be found. All of this is, of course, fairly depressing to fans of the series who had hoped the Enhanced Editions might eventually lead to a third entry in the vaunted franchise.